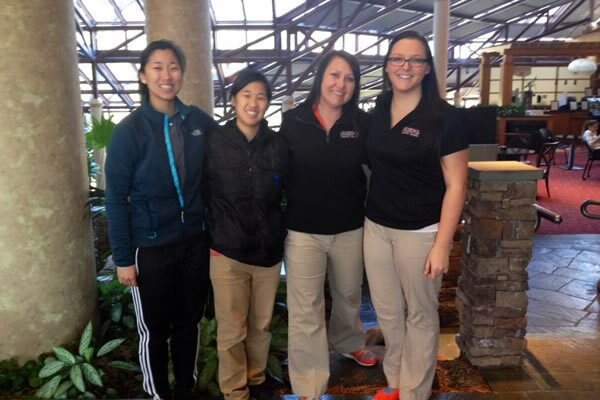 University of the Pacific Athletic Training Students Diana Wang, Katie Yakel, and Victoria Lu, and AT Professor Jennifer Hoenig attended the South Eastern Athletic Training Association (SEATA) 29th Annual Athletic Training Student Symposium in Atlanta, GA on Feb. 6-8, 2014. The SEATA, or District 9, is represented by Alabama, Florida, Georgia, Kentucky, Louisiana, Mississippi, Tennessee, Puerto Rico, and the Virgin Islands. In addition to attending keynote speaker presentations, AT student clinical case study presentations, and participating in laboratories headed by faculty, UOP ATP representatives had the unique opportunity to meet and network with fellow athletic training students and professionals from District 9. The long journey across the nation proved to be valuable as students and faculty came away with new skills and experiences!